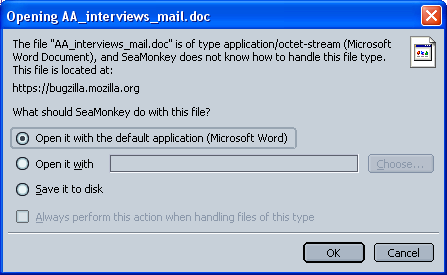 Starting in Firefox 3 and in SeaMonkey 2, you can manage what download actions are taken for file content types (MIME types) via the Applications tab in Firefox, shown here, and in the Helper Applications panel in SeaMonkey 2, [[#Managing content types - SeaMonkey 2|shown below]]. (This applies to downloaded files only, not embedded content.) 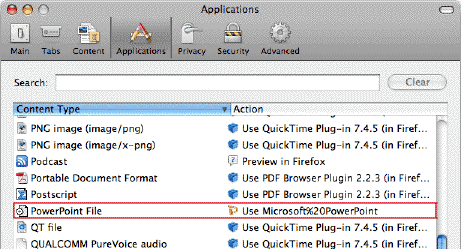 You can also set "Always ask" as an action for a listed content type (but note that the [[#Opening dialog|Opening dialog]] does not allow you to select a plugin action; read [[Opening files using plugins#Always ask|Opening files using plugins]] for more information). 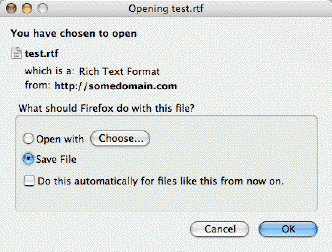 [[Live Bookmarks - Firefox#Web_feeds|Web Feeds]]/Podcasts will also be listed as well as certain [[Register protocol| Internet protocols]] such as "mailto" or "rtsp". 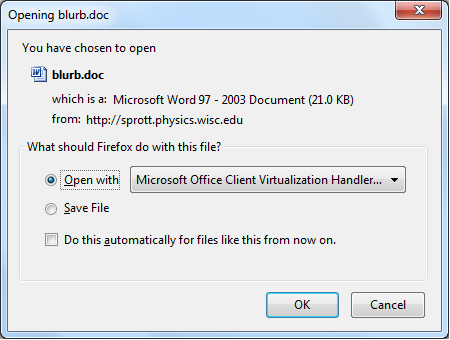 Starting in Firefox 3 and in SeaMonkey 2, you can manage what download actions are taken for file content types (MIME types) via the Applications tab in Firefox, shown here, and in the Helper Applications panel in SeaMonkey 2, [[#Managing content types - SeaMonkey 2|shown below]]. (This applies to downloaded files only, not embedded content.) 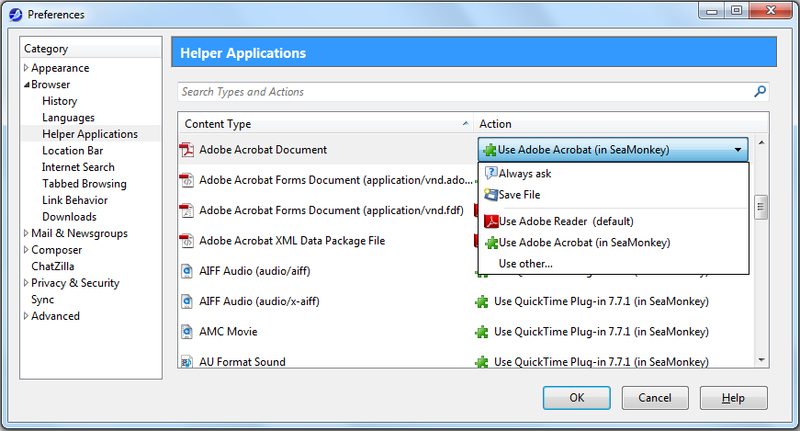 You can also set "Always ask" as an action for a listed content type (but note that the [[#Opening dialog|Opening dialog]] does not allow you to select a plugin action; read [[Opening files using plugins#Always ask|Opening files using plugins]] for more information). 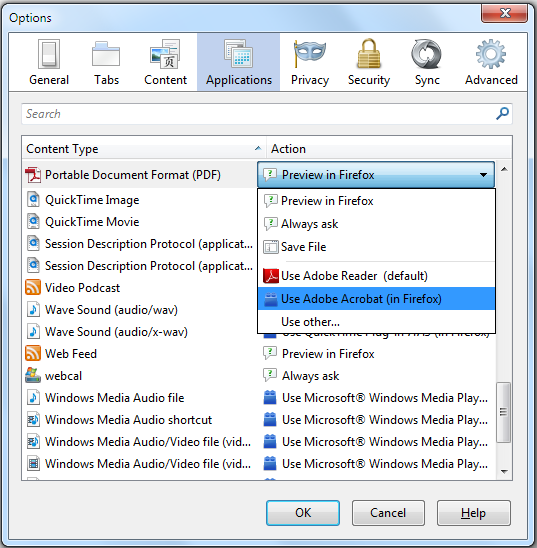 [[Live Bookmarks - Firefox#Web_feeds|Web Feeds]]/Podcasts will also be listed as well as certain [[Register protocol| Internet protocols]] such as "mailto" or "rtsp". 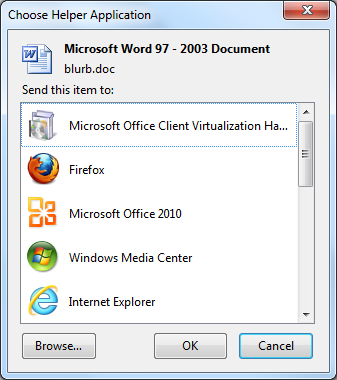 - '''Important:''' Certain file extensions (such as .mp3) may include multiple content type entries, one for each MIME type associated with that type of file. + '''Important:''' Certain file extensions (such as .mp3 or .wav) may include multiple content type entries, one for each MIME type associated with that type of file. 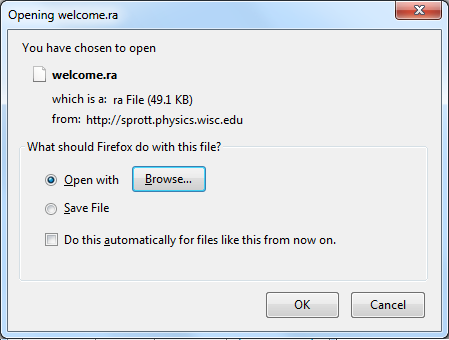 The "Open with" option can show a "Choose" or "Browse" button, if no application is associated with the file type (shown here on Windows), or it may show a default application for the file type. 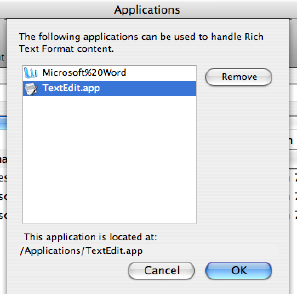 You can choose to open the file with that application or you can choose or browse to a different application. 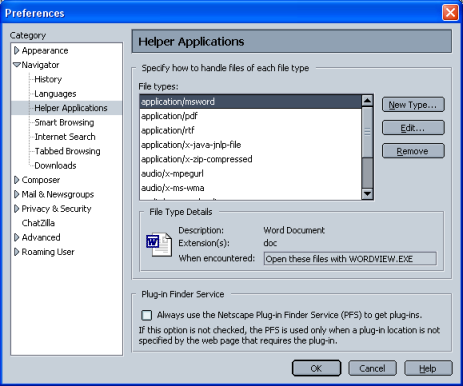 You can use the "Browse" button or click the drop-down menu icon and then click on "Other" to open a "Choose Helper Application" dialog, as shown here on Windows. 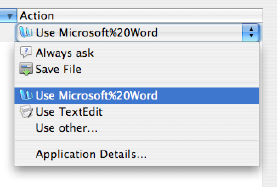 Delete (or rename) the file mimeTypes.rdf. 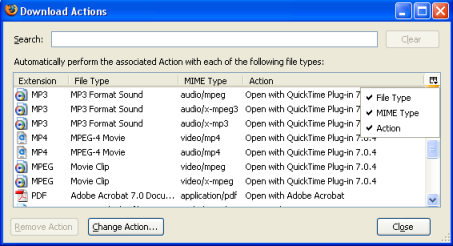 Important: Certain file extensions (such as .mp3 or .wav) may include multiple content type entries, one for each MIME type associated with that type of file.